Adelaide United coach Marco Kurz and Sydney FC striker Matt Simon have leapt to Michael Marrone’s defence, describing the defender’s manhandling of a ball boy as out of character, as Sydney FC clinched the coveted domestic treble deep into extra time last night. Marrone is facing a hefty ban after the FFA Cup final incident, in which he knocked down the youngster while trying to grab the ball back quickly to take a throw-in after his team conceded Bobo’s eventual 2-1 extra-time winner. His actions earned him a straight red card and sparked an all-in melee involving most players, coaches and backroom staff from both Sydney and Adelaide. Simon triggered the blow-up when the famously fiery Sydney forward ran in and grabbed Marrone, prompting Kurz to restrain the opposing player. “It was hard work for 30 seconds, strong boy,” Kurz said of Simon. “There was emotion on both sides, I was trying to calm him. After the match, a more composed Simon labelled the whole fracas “a heat-of-the-moment thing”. “Mickey obviously wanted to get the game going quicker,” Simon said. “We all know Mickey hasn’t got that in him, but unfortunately it happened. “The ball boy held the ball and Mickey wanted to get it back into play quickly, and he took things into his own hands. 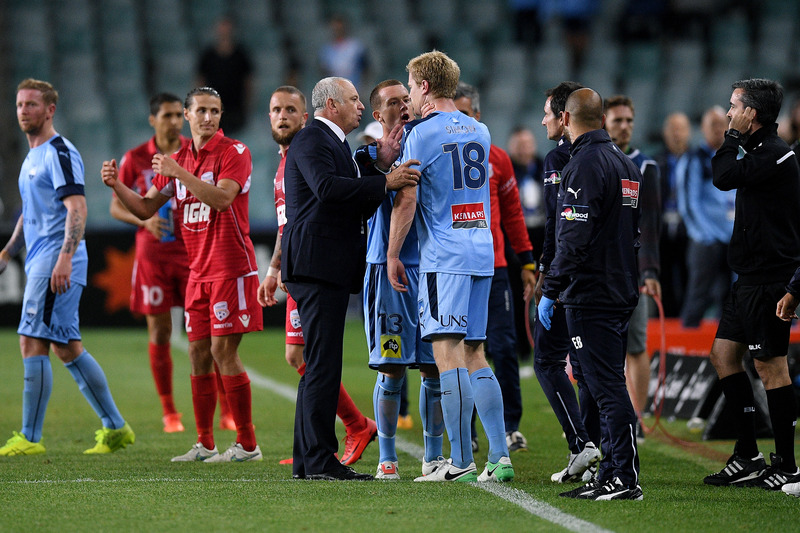 Police could be seen speaking with the ball boy, who was unhurt and was later given a Cup winners’ medal from Sydney left-back Michael Zullo. Kurz, who apologised to the boy and his father, reiterated Marrone’s actions were not in his usual nature. “Mickey is a very quiet boy,” he said. “I can only say sorry and Mickey is very down in the dressing room. I think he spoke with the boy after the game. Nevertheless, Football Federation Australia will likely treat the incident seriously, with a ban of several games a possibility. There is no known precedent in Australia, though Chelsea midfielder Eden Hazard copped a three-match ban for violent conduct after kicking out at a ball boy in 2013. Milos Ninkovic opened the scoring and Nikola Mileusnic levelled with the first away goal in the Cup’s short final history, before Bobo finally separated the sides in the 111th minute, as Sydney FC clinched the coveted domestic treble. The late drama overshadowed the enthralling affair in front of 13,452 people at Allianz Stadium. On the pitch, Graham Arnold’s men convincingly added a third trophy to their A-League Premiers’ Plate and championship in arguably their best performance of the season. “I’m so proud of the boys,” Arnold said. “With such a short turnaround, the Newcastle game was hard but to put in a 120-minute shift and find a way to win. For all that, Adelaide had the first chance of a scrappy opening when Ryan Kitto latched onto Nikola Mileusnic’s cross and took a point-blank stab. A desperate Alex Wilkinson evoked the last-ditch slide but it was Andrew Redmayne who got his body in front of it just in time. Their period of dominance yielded a goal in the 19th minute when Bobo fed to Alex Brosque and the skipper, on an intelligent run to the left, rolled the ball to the feet of Ninkovic. Surrounded by Red shirts, the Johnny Warren medallist took a touch with his left foot, shifted the ball to his right to divert a sliding Marrone, and slotted past Paul Izzo. Not 10 minutes later Ninkovic was down and receiving treatment for an apparent calf injury, finally returning to play but visibly hindered until David Carney relieved him on the hour mark. That the Serb still managed a remarkable pass to put Brosque through in Adelaide’s box was evidence of how much he would be missed for the remainder of the contest. By that time, the Reds had steadied the ship and entered Sydney’s area with increasing regularity. Though they rarely threatened once there, Redmayne could count himself lucky Ben Garuccio’s free kick clattered flush into the upright. The goalkeeper was clearly beaten and frozen to the spot, but managed to regain composure in time to collect the Reds’ follow-up. There was nothing he could do about Adelaide’s equaliser. Ersan Gulum released Mileusnic on the right, the winger drawing in Michael Zullo before cutting inside to curl the ball around Redmayne into the top left-hand corner. Sydney should have had their winner and more but for Izzo’s late heroics, saving a Bobo header at point-blank range and then denying the Brazilian striker again two minutes later. Despite a late Sky Blues penalty appeal when the ball struck Marrone’s arm in the box, the contest wasn’t done in 90 minutes. The Reds came agonisingly close to an extra-time winner, Matmour missing a sitter and substitute Mark Ochieng skying another with the goal and a first away Cup triumph beckoning. But Bobo struck off Arian Mierzejewski’s free kick, and by the time Marrone was red-carded for manhandling the ball boy the match belonged to Sydney. “For me the free kick for the second goal, it’s not a free kick,” Kurz said.